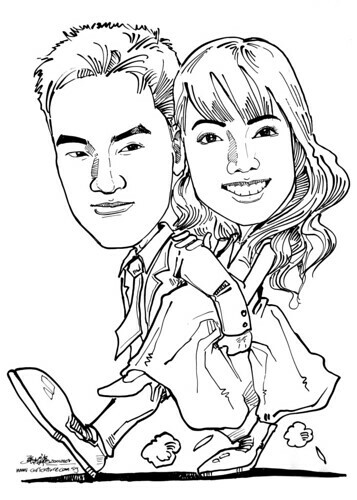 This couple will be using these caricatures for their wedding invitation card. In fact, if they want to lower the cost of printing in choose one colour printing, they can opt for caricature in colour with wedding theme. With the shading, it brings out the facial muscle better. To reduce cost by using one colour, they can opt for sepia tone printing. The outcome is a lot better. One of my clients did that before. Just that I don't have a copy on my side. This round, I am still using fountain pen for this job. A different feel from using the G-pen and brush. Wonder how it will turn out on the card when it is a reduced version.